To many, travelling means escaping the mundane daily lives, a chance to gain new experiences in far away places, or simple a time to distress and chill. Sadly however, most travellers do not consider the risks that could happen during the trip and therefore are left unprepared when the most unfortunate of events occur. Travel risks aren’t something that cross our minds when we are busy planning for a business trip or a family vacation. But to the wise traveller, it is an inevitable subject. 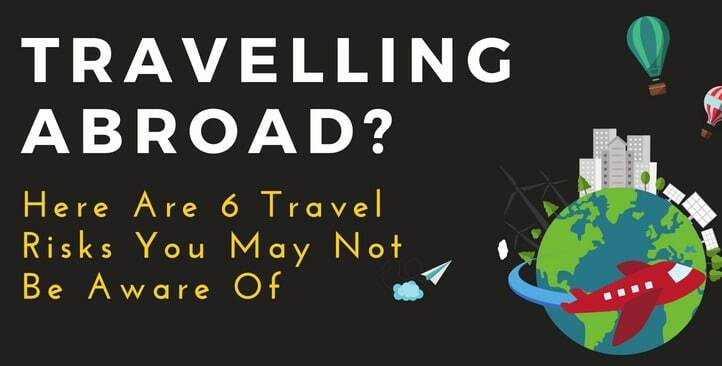 So in our effort to educate the public, especially those aspiring wanderlusts out there about traveling smart, here’s an infographic we hope can help highlight several travel risks that you may not be aware of. Flight delay and cancellation may occur due to several factors such as bad weather, airline glitches and technical issues. As a result, not only you could miss your connecting flight, important events at destination such as business meetings and weddings, paid tours etc, but also you could end up being stranded at an airport for hours, costing you more money on meals and even additional room charges in case of an overnight delay. But what about all the money that you have paid on flight tickets, booked tours, hotel stays, and all the additional expenses caused by these setbacks? Sometimes luggage can be delayed up to days before they are found and delivered to us, in which case we should still count ourselves lucky as some luggage may disappear forever. But have you thought about what would happen to you at your holiday destination without all your packed clothes and belongings? You will most likely end up having to spend money on additional clothes and basic necessities such as toothbrush and other toiletries. This will eat up into your vacation fund or savings. The unexpected luggage trouble and additional cost incurred will more likely than not, result in a less than enthusiastic holiday spirit. It is easy to lose sight of your belongings while you are engrossed with the beauty of the foreign lands. If one isn’t careful, one can easily neglect an important item, such as a camera and mobile phone. Not to mention the susceptibility of the inexperienced travellers falling prey to the seasoned scammers. These items don’t come cheap. And losing them means having to fork out hundreds if not thousands of ringgit for replacement. Losing your passport could spell more trouble. Not having a passport with you means you are stranded in a country, not able to continue to the next destination, nor return to your home country. You’re not only incurring more cost in getting your passport replaced, but also may end up paying more for accommodation for the extended stay while waiting for your new travel documents to be ready. The inexperienced travellers are often taken advantage of by scammers and opportunists alike. Their vulnerability often lead to them to being victims of deceptive tactics when traveling abroad. This often result in them being robbed or scammed off their money in more subtler ways. Not all hotel safe boxes are safe either. Especially if you’re staying in a dodgy 2 star accommodation in the back alley. There is no guarantee that your money will be there when you get back after a long day of sightseeing. To continue your holiday after all your money is lost means having to borrow from sympathetic friends and living on a tight budget for the rest of your trip. Sometimes things happen that is out of our control. Things that may cause us to cancel a scheduled trip, or even cutting short a holiday while we are already abroad. When such an event occurs, it is most unfortunate as most often than not, the deposits made are not recoverable. Trip cancellation or curtailment could mean a loss of thousands of ringgit in money spent on flight tickets, accommodations, car rental, booked tours and excursions. Not only your trip is affected, you’re losing tons of money to boot? We’ve all come across news and stories of Malaysians stranded in foreign hospitals, unable to pay for the exorbitant hospital charges after receiving treatment for illnesses or injuries. This risk should never be taken lightly as sickness and injury can happen to anyone, anywhere. While it may be a part of the daily life while at home, falling sick when you are abroad is a whole new ball game. Firstly, you are exposed to all sorts of new germs, bugs and unfamiliar environment, increasing your risk of falling ill. Secondly, do not expect to just walk in to a clinic and pay RM 50 for consultation and medicines. Without the proper insurance coverage, you could exhaust all your life savings on these unexpected treatments. That is, if you even have any saving. As a conclusion, we’d like to remind our readers to consider these travel risks when planning for your trip. Although these unfortunate events could happen to anyone, anywhere, there are ways to minimize their impacts. Aside from exercising all the safety precautions, you may want to consider travel insurance for its many benefits especially in covering for your financial losses from these mentioned risks.